One of my all time favorite appetizers is Clams Casino. It's an item you rarely find on menus these days but it is truly a Classic Restaurant Dish. Check out my easy to make recipe. It had been a long since I’d indulged in Clams Casino or even thought about them. I had forgotten just how delicious they could be and how much I loved them. Sometimes I think the world tends to forget about Classic Restaurant Dishes. As they become less trendy and chefs color outside the lines with their new creations, old favorites are forgotten. And that my friends is why I’m sharing one of my all-time appetizers with you. They’re really easy to make and will have you looking like a superstar in the kitchen! What is the difference between Clams Casino and Clams Oreganta. The much simpler version of Oreganata contain bread crumgs and seasonings. 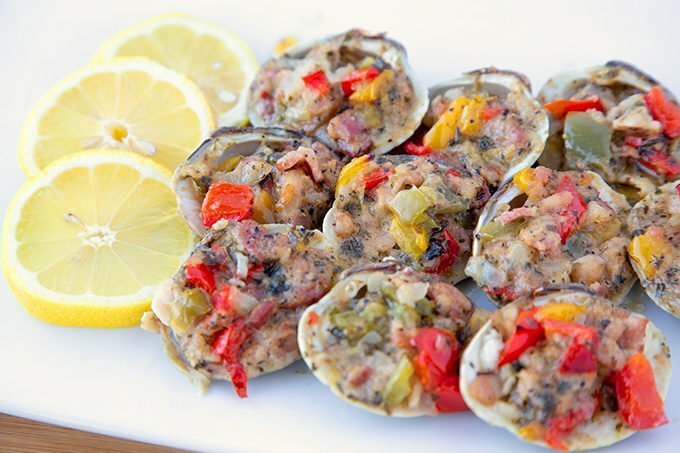 The upscale Clams Casino add bacon, peppers and onions creating a symphony of flavors. Lets start by gathering the ingredients we need to make Clams Casino. This is called a Mise en Place (everything in its place). Missing from the ingredients are bread crumbs and butter. 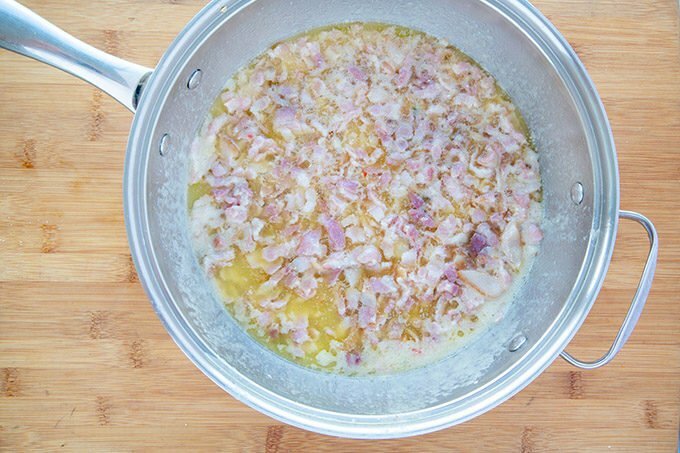 The first step is to saute the chopped bacon in butter. I know it sounds crazy but its delicious and necessary. After the bacon has cooked for about 5 minutes, add in the diced peppers and onions. I used a mixture of sweet peppers but feel free to use all one color. After the mixture has cooked over medium low heat for 10-15 minutes add in the seasonings. 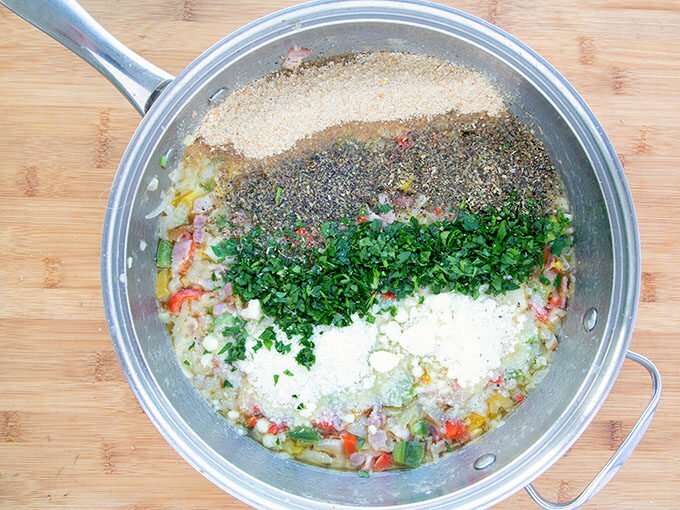 Mix the seasonings into the mixture. Mix well. 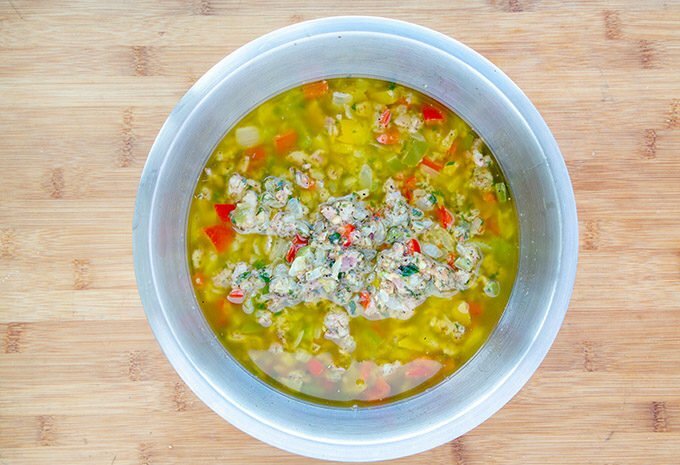 Pour the mixture into a bowl and place in the refrigerator. Don’t freak out about the butter, as the mixture chills you’re going to stir it adding the butter proportionally throughout the mixture not just on the top. Let the mixture chill for at least an hour, stirring every 15 minutes. The mixture can be made up days in advance. It will hold well in the refrigerator. Do I need to clean the clams before opening? Before opening the clams place them in a bowl and allow cold water to run over them for about 5 minutes. Dump the water out every now and then to make sure it is as clean as possible. How do I open the Clams? Unless they are intended for Clams on a half shell, I have a secret method to make life much easier. Place the clams into the freezer for at least an hour or overnight.When removed from the freezer you’ll find the clams are opened slightly. And that means no clam knife, no accidental cuts and no trips to the hospital for stitches. Of course, if you’re a purist feel free to use a clam knife. But I promise not to tell anyone if you use my secret method. Using a small knife and place the blade in the corner of the shell and twist it to pop the shell open a little more, once it’s opened up, use the knife to go above and below the clam freeing it completely from the upper shell. Now twist off the top and discarded it, give the clam a quick rinse if necessary and use the knife to make sure the clam is loose from the bottom of the shell as well. The easier you make it to slurp the clam off entirely into your mouth the more clams you will be able to eat. After all the clams are opened, using a tablespoon (or your hands) add a large spoonful of the casino mixture on top of the clam. Press it in firmly using the spoon or your hand. Can you freeze Clams Casino? Clams Casino will freeze very nicely. 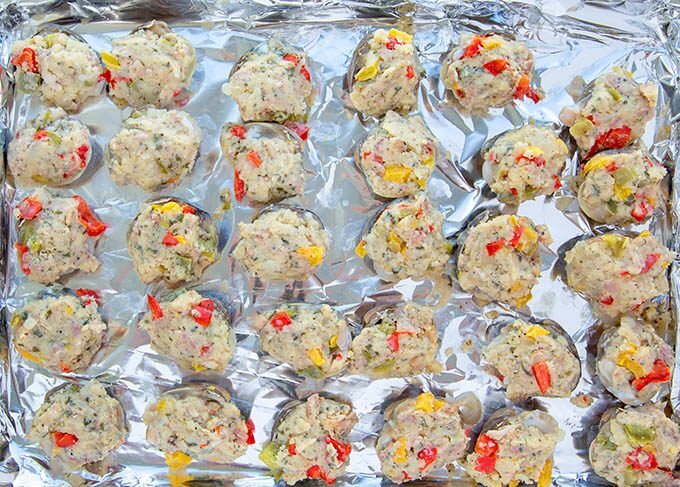 After stuffing them, place the sheet pan in the freezer allowing the clams to freeze. After the clams casino have frozen solid place them in a container or ziplock bag for storage. The clams casino will hold up frozen for 4-6 weeks. 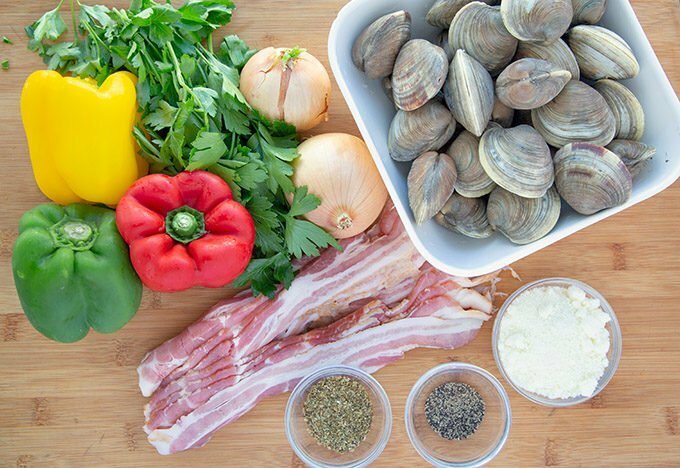 Clams Casino are not difficult to make and the few extra steps involved are definitely worth the effort. After tasting your first one I’m sure you’ll agree! 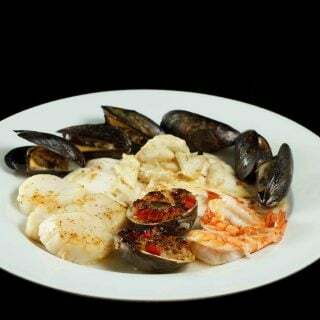 When purchasing any seafood, clams especially, look for a safe food source. If the clams are open prior to freezing or opening with a clam knife, discard them. You can open your clams the old fashioned way or use my shortcut and place the thoroughly rinsed clams in the freezer for a minimum of one hour up to a week. The clams will open slightly which will allow you to easily open them the remainder without risking cutting your hand. 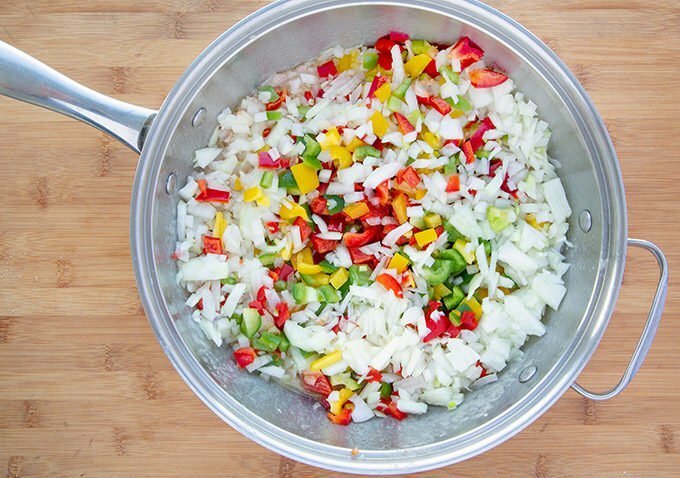 Add chopped bell peppers and onion and continue to cook over low heat for about 15 minutes. Remove the pan from the heat and add the grated Romano cheese, bread crumbs, black pepper and oregano. Mix well. Place casino mixture into the refrigerator to allow the fixture to firm up. Stir Mixture occasionally so all the ingredients stay well blended. This will take at least 2 hours, so give yourself time. Open clams, running a knife under the clam to make sure it is unattached from the shell. Place opened clams on a cookie sheet until ready to fill. Remove casino mix from refrigerator. Using a tablespoon add the prepared Casino mix to the clam. Make a nice mound of it on top of the clam by pressing the casino mix into the clam firmly with your hand. Repeat this process until all of the clams are stuffed. Place the clams into a preheated 375 degree Fahrenheit oven for 15-20 minutes or until the bacon and tops begin to get nicely browned. Remove carefully from the baking dish. Re-stuff clams with mix that fell out if necessary. Serve clams on a serving dish or on a bed of rock salt with lemons and parsley as a garnish. *I used multi-colored peppers for visual effect. You can use just red or green if you like. Any type of white or yellow onion is fine. I prefer Vidalia onions. *Casino mix can stay refrigerated for at least 3 days before you use it. *Clams can remain in the freezer unused for up to a week. *Once clams are stuffed they can remain refrigerated for 1-2 days or frozen for later use. This looks super fancy! I wonder if I can get good clams in my area. It is a bummer sometimes to be totally landlocked. This appetizer is definitely very fancy and looks amazingly delicious! A must try recipe! Oh, Chef. You have created a monster at our house. My husband LOVES this recipe and has included it in the next four gatherings we are hosting. It’s delicious, so thank you! Now this Clams Casino looks delicious! 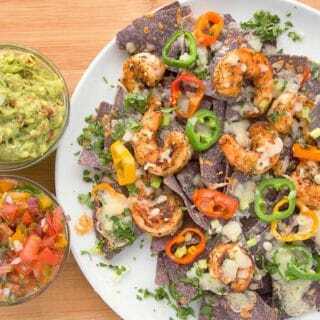 I don’t think I’ve ever had this recipe but it sure makes my mouth water! Now that looks like something my daughter would love. 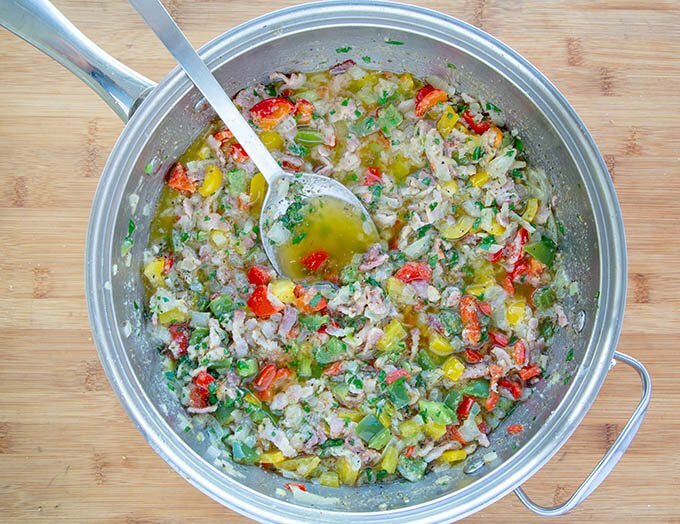 I love anything seafood so this is my jam, thanks for the recipe. I need to make these for my husband. He would absolutely love these! I haven’t had clams casino in so long! It’s so good, I can’t believe it’s actually this easy to make. 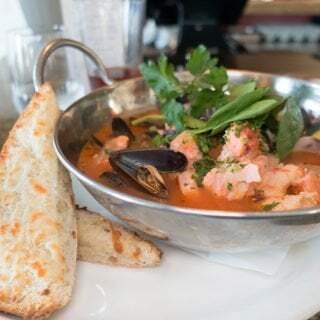 I don’t eat clams often but they are a delicious, delicate flavor. 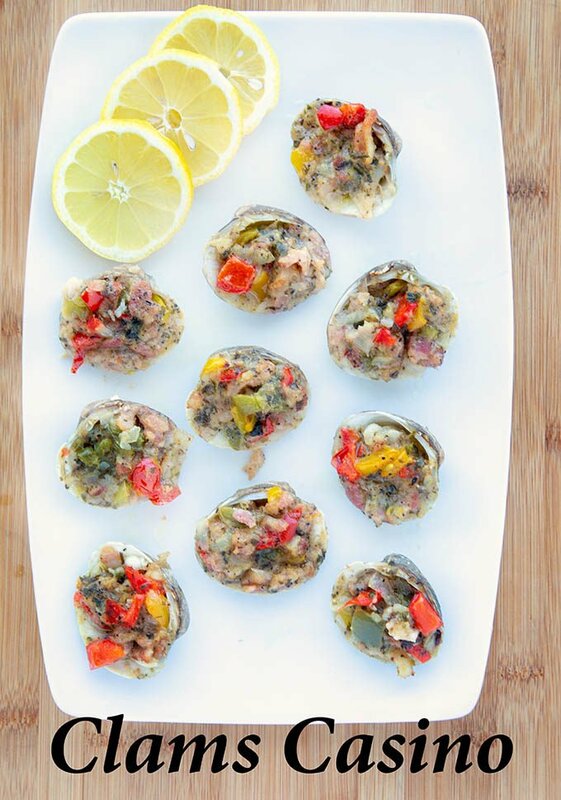 These Clams Casino look delicious and spectacular! I’ve never had something like this, and I’ve never even actually cooked with clams. Looks like a fun recipe especially to serve when we have guests over. These look good. 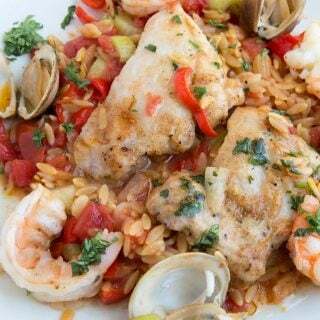 My husband and kids love their seafood, so I imagine they’d enjoy these. I might surprise them one night! I’ve never had claims casino before. This recipe looks so savory. I have to make this for my spouse. I know he would love it. I have never made any dish with clams. You make it look so easy and have definitely inspired me to give it a try. I LOVE clams!! I will try them anyway they can be made! I have not heard of these before but I will be trying this recipe. I have never made clams casino but it looks like a great dish. It is upscale and too good sounding for a game and is perfect for a dinner part appetizer. Your Clams Casino look so delicious and I LOVE the tip on opening clams. I had no idea! I always look forward to learning new tips and tricks when it comes to cooking. 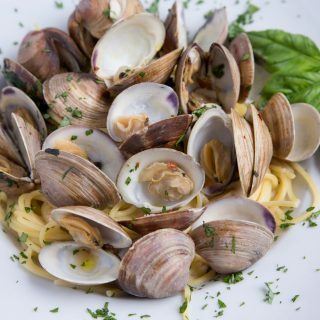 It’s been nearly 50 years since I had clams casino while living at home in South Jersey and after reading this I’m craving them – they look delicious and I’ll be looking for some clams. 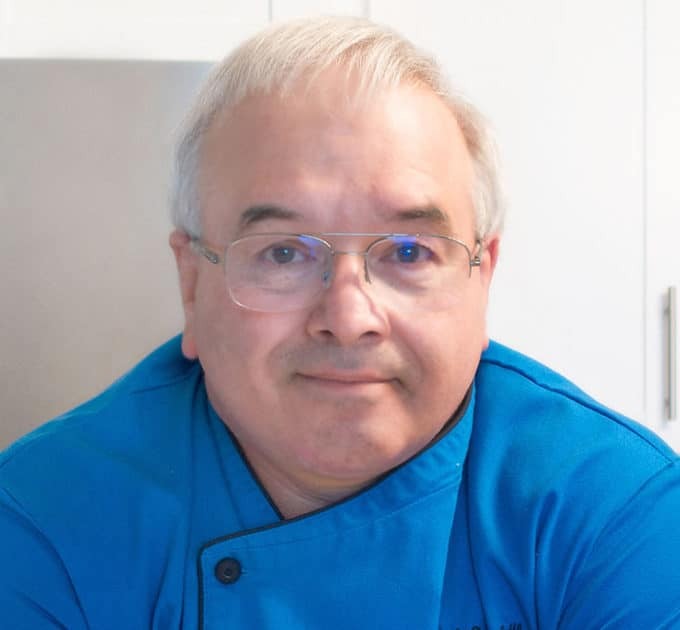 Thank you Larry, you really don’t see this recipe anymore, which is why I decided to share it.